When only the best roofing for your Newmarket home or business will do, call us for quality materials and workmanship. Do you know what makes a roofing project successful? At Slippery Slope Roofing, our 50 years of combined experience in the roofing industry put us in the position of knowing what needs to be done on every roofing project to make it last. First and foremost, it’s a dedication to doing the job right – no cutting corners and always giving each roofing project the attention it deserves. That is why we put our crew on just one project at a time. Whether you need roofing for your Newmarket, Ontario home or business, we’re in it 100% from beginning to end to achieve quality results that are on budget and on time. 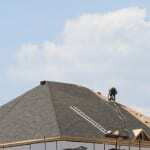 In addition to our dedication, you can expect that only quality roofing products will be used. For example, we use IKO residential shingles. They set the standard for roofing shingles with architectural and traditional 3-tab products. We also offer BP and Owens Corning roofing products, both respected names in the roofing industry. Each of these companies offer plenty of choices and colours, so we are able to match the style of your home. Roofing shingle manufacturers offer warranties on their products, and we do our part by installing them in accordance with their policies, so the warranty is intact. That means using the right underlayment and techniques so the roofing shingles can do what they were crafted to do. When you want a roofing contractor who focuses on just your project, uses quality materials, and keeps a clean worksite, the clear winner is choosing Slippery Slope Roofing. We also do new roofing installation and roofing repairs.